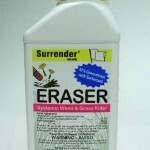 PRODUCT DESCRIPTION: Total Kill herbicide for any kind of weed or grass. Similar to Roundup but better. It leaves no residual so turf or other areas where it's applied can grow grass or other plants within a short period of time following treatments. WHERE TO USE IT: Parking lots, driveways, along fence rows, pine isles, mulch islands and just about anywhere you want to knock out persistent weed growth. 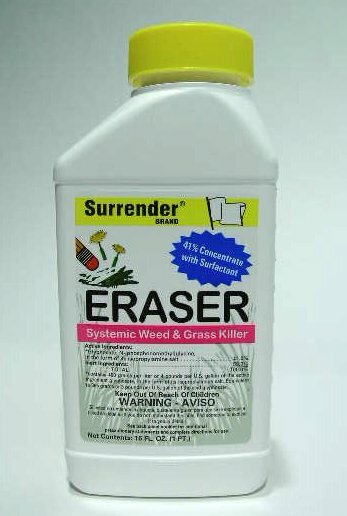 Remember, Eraser is a total vegetation kill so be careful of over spray and drift. RATE OF APPLICATION: This product has broad rates of mixture depending on the target weed. For most, 1.3 oz per gallon per 2000 sq/ft of weed will do the job. It can be mixed 2.6 oz per gallon per 2000 sq/ft and even stronger if needed. For large jobs estimate usage to be 12-48 oz per acre. RELATED PRODUCT: Be sure to add some SPREADER STICKER to your tank mix to enable Eraser to work faster and more efficiently. Spreader Sticker will help any type of herbicide, insecticide, fungicide, etc. and is a great way to enhance the performance of any mixed solution.